as the inspiration for a mass movement for social justice and as a dynamic spiritual practice. The new Buddhists of India have adopted teachings and practices familiar to Buddhist traditions in Asia and the West, but they also see the teachings of the Dharma as a way to transform the oppressive society in which they live. 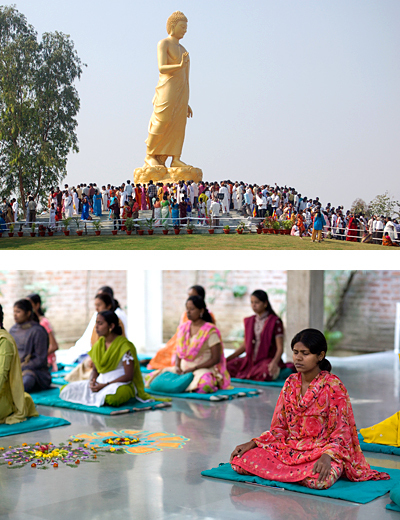 The Buddhist Renaissance in India started in 1956 when Dr. Bhimrao Ambedkar, the leader of the Dalit (formerly “untouchable”) community, formally converted to Buddhism. Although he died shortly thereafter, the movement he started is continuing to grow throughout India. Today millions of poor people in India see Buddhism as a way to realize the self-respect and dignity that is denied them because of the Indian Caste system. Many of them are engaged in activism based on the social ideals of equality, freedom and non-violence. Within the new Buddhist community there is a strong interest in learning how to practice the Dharma – the teachings of the historical Buddha. important social movements in the world, and it represents an important development in modern Buddhist history. Unfortunately, because it is a movement of very poor people it is not well known outside of India. The goal of DharmaJiva is to provide information about the Buddhist Renaissance and support Buddhist social activists and Dharma teachers in India. For more information, please email us at info@DharmaJiva.org.